Whether you’re using Uber to rush to class, or fueling up for THON™ Weekend with Uber Eats, you’re helping to support the fight against childhood cancer! Between Monday, February 12 at 10am and Friday, February 16 at 5pm, Uber will donate $1* toward THON for every Uber trip taken and Uber Eats order delivered on campus! 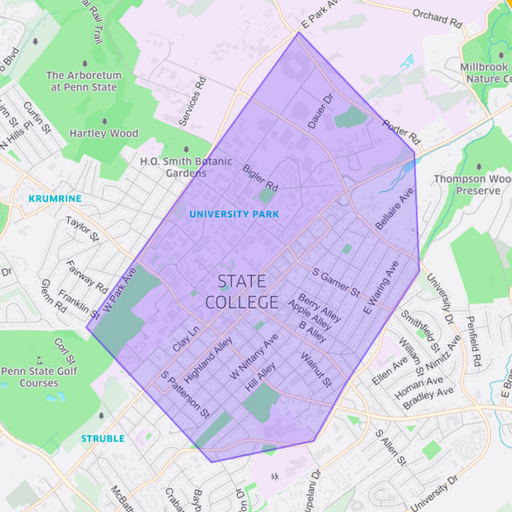 Uber trips must begin or end on Penn State’s campus, and Uber Eats orders must be delivered on campus in order to be eligible for a donation. See the map of the eligible donation area below. *Uber will donate up to $14,500 and Uber Eats will donate up to $5,000. Valid from 2/12/18 at 10am through 2/16/18 at 5pm. These $1 donations will be funded by Uber and Uber Eats and not charged to the rider and or eater placing the request.